Not many people realize just how special and impressive the guys in Alter Bridge are. They haven’t just risen to the top with Alter Bridge- no. What Mark Tremonti, Brian Marshall and Scott Phillips have been able to do is that of pure legend and something that most musicians only dream of and fewer actually achieve. Not only are they front of the pack in Alter Bridge, but they ruled the world for years in their first band- Creed. No matter what you say- pretty much everyone loved Creed at one point. When that band crumbled, the band members chose not to quit- rather they started a new band and enlisted one of the greatest and most underrated voices of all time- Myles Kennedy- and the rest was history. Now, they’ve released a record that’s chock-full of goodies and treats for their most dedicated fans- Live At the O2 Arena + Rarities, which is- as you can probably guess- mainly loaded with live tracks from the O2 Arena. It’s a 19-track headline set that’s guaranteed to set your ears on fire with greatness- there are tracks from every album in the setlist and they make sure to leave you purely satisfied. 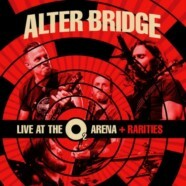 If that wasn’t enough, we get 11 “rarities”- or bonus/unreleased tracks from each album, which is enough to make even the most laid back Alter Bridge fan giddy with excitement. Often times, a “rarities” or “B sides” song is just used as bonus content for different editions of an album release- a European, Japanese, Deluxe or ITunes edition, and a lot of the time it isn’t much to cough at. Not here. Not with Alter Bridge. The band always makes sure their fans get the absolute best of what they have to offer and this is no exception. Some of these make you wonder why they were even left off of the final cuts, they’re that good. “Solace,” “Zero,” “Never Say Die” and others are hands-down some of the most impressive rarity material we’ve heard so far. If you’re a diehard Alter Bridge fan, you probably bought the record the day it came out or pre-ordered it the second it was available. AB fans are just that dedicated- mainly because they know they’re going to get their money’s worth and get something that’s as close to perfection as you can get. Live At the O2 Arena + Rarities isn’t just a live album with unreleased material. It’s a live experience with what can only be described as a surprise sixth studio album. If you’re new to Alter Bridge or you’re just a casual listener- go pick this package up- like, yesterday. It’s got every major Alter Bridge song on it and it’s three discs of pure magic.